Christiaan Snouck Hurgronje, the Netherlands’ best known and most controversial Islamic scholar, worked for seventeen years in the Dutch East Indies. In 1899 he was in Aceh (Atjeh), which was then in a state of war with the Netherlands. During a military expedition to the eastern part of North Sumatra he discovered the beautifully decorated tombstones of the sultans of Pasai (13th-16th centuries). In 1906, the year Snouck Hurgronje returned to the Netherlands, a project started under difficult circumstances to research the old graveyards and in particular the inscriptions of the headstones. He continued to co-ordinate the project, and from 1912 onwards the archaeological survey was carried out by a young draughtsman-photographer, Jean Jacques (Jan) de Vink (1883-1945). 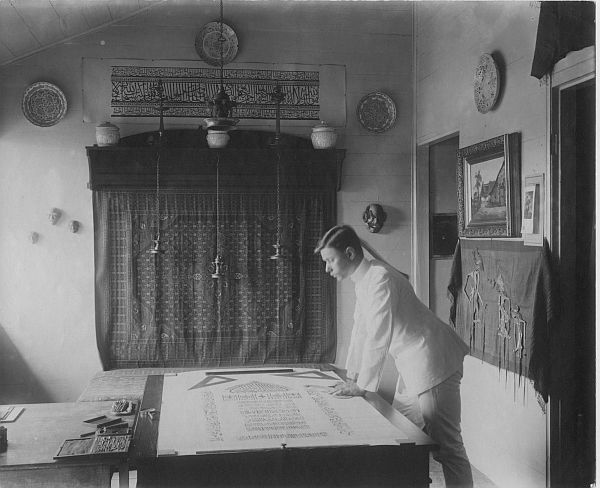 He made photographs, drawings and maps, also three-dimensional impressions of the inscriptions with the help of papier-mâché (the so-called ‘Abklatschen’) and wrote detailed reports. All materials were dispatched to Snouck Hurgronje in Leiden.